Heat cream cheese in microwave for about a minute until soft then whip in bowl till smooth. Add Cool Whip and continue whipping. In another bowl, mix pudding according to package instructions. Add pudding to cream cheese mixture and beat slowly with a mixer. 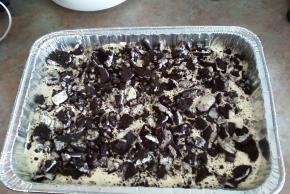 Crush a full bag of Oreo Cookies (I use double stuff) in a gallon size baggie and put in the bottom of a 9x13 pan. Add pudding mixture over top of crushed cookies. Then crush about 1/2 bag of Oreo Cookies and add to top. Refrigerate.